In this photo the middle young lady in pink is my oldest child Heather. The other ladies are her friends. They are all in Junior League and this photo was taken at the Parade of Lights in downtown Arlington which they were helping to sponsor. This paper is by Bo Bunny Father Christmas and Reminesce. I was given the red lacey ribbon by Maya Roads which I decided to put around the circle of the paper and then added lots of poinsettas and stars. I then added little pearls by Viva Pearl Ink around the edge of the paper. The snowflakes and clock are from Maya Roads which I added Chestnut Roan ink around the outer edges and then added buttons and cardstock Christmas design to the centers. I finished it up with a white and green ribbon, button, and stick pins by Maya Road. I added the scallop edging at the bottom and the little sign that says Christmas Wishes! Thank you so much for peeking!!! This photo is my daughter Heather and her boyfriend Troy. This was taken at our home a few days before Christmas. We had several reindeer show up and this photo shows them holding on to one of the deer. I just love this mini album. I glued the paper on each page and then sanded it down nice and smooth. I then added Merry Christmas. I had in my own stash this pocket watch which comes in 2 separate pieces. I added the little reindeer and then glued it all together. I then painted it with Gold and then added Star Dust Stickles on top to make it glisten. I also had the holly and berries which I painted with dabbers ( green and red) and then added the stickles to make it shine as well. I felt that it just needed a little something else so I added this little flourish which I painted black and added…you got it….Star Dust Stickles!!! This mini album had a chain attaching all the pages but I took that off and added my little red ring and added lots of ribbon. The photo on the left is at my home a few days before Christmas. This is my family and some reindeer that came to visit all the grandchildren. They all had a great time. The photo on the right is Mrs. Claus and Santa arriving that same night to make sure everyone has been good!!! On the left I added Bo Bunny trinket and a poinsettia with tiny white & blue snowflakes with little pearls added to the centers. I added our Family as well. On the right I added Bo Bunny trinket with Maya Roads snowflake. I added white ribbon which I painted light green with a green pearl. I also added tiny little snowflakes as well. 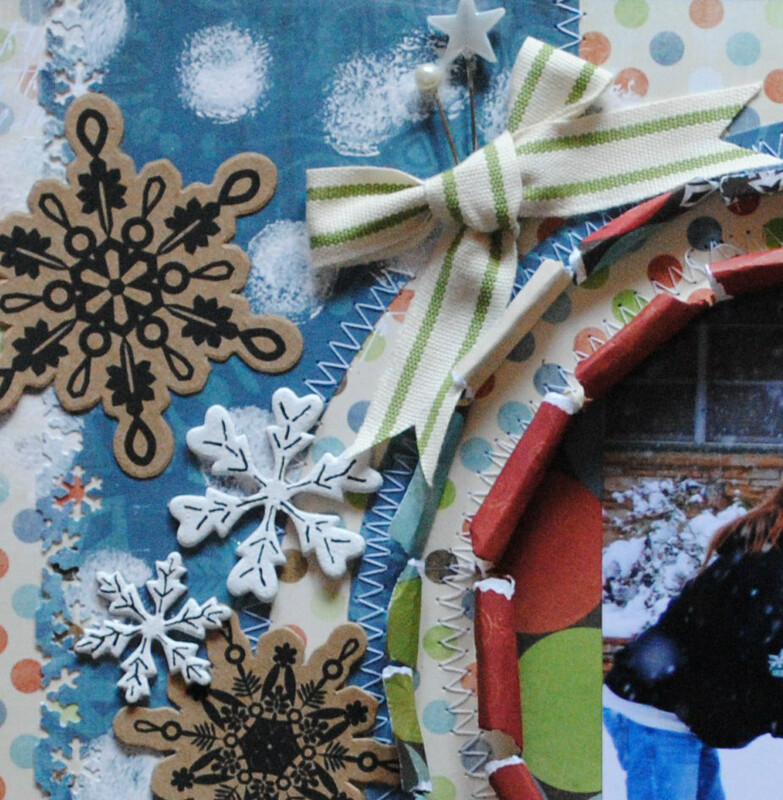 On these two lovely pages I added the Christmas paper and added these two sweet photos. The one on the left is my grandson Logan talking to Mrs. Claus and Santa at our home. The photo on the right is all our grandchildren listening to Santa reading to them “Twas The Night Before Christmas”. I just love watching their little faces as Santa is reading. These two pictures were taken a few days before Christmas which Santa also brought to them a little pre-gift. On the left side I added Maya Roads greenish blue rose ribbon and I had a little snowflake but then I added a rose ornament from Maya Roads to make it really stand out which I then added a little green glass piece to the center of the rose. I also used Bo Bunny Christmas ornament and added the little glass pieces to it as well. I then added Star Dust Stickles to the little berries in the paper. On the right side I added another snowflake which I painted with a dabber and then added another little snowflake on top with a green glass piece. I used by Graphic 45 a tag of Santa reading to children which worked perfectly with the photo I had taken. I used ribbon to place it on the page and then I added a little lace flower and added by Bo Bunny a cardstock button and ran thread through it. I then added stickles to make it all twinkle!! The photo on the left is my grandson Logan and on the right is my granddaughter Kenzie on Christmas Eve. They are all given a gift to open for being so good throughout the year! On the left I already had a wooden frame which I painted using Pepper Dabber and then added Logan’s little photo. I was given by Maya Roads a brown clock which I used Aqua ink and then added white and blue snowflakes and then added a little pearl to the center of each one. I also used Bo Bunny brown button and added white ribbon which I painted blue and then of course I had to use stickles to give it a twinkle. On the right side I added a blue border around the photo. I was given a white cloth button (on the top right corner) which I made a pretty little bow and then added a white button which was given to me and a little cardstock and tied it all on with a blue thread. I was also given a little teapot and cups and a cupcake which I thought looked really well with the photo of a little girl and her doll. So…I painted the teapot and cups plus the cupcake. I then added the black design. To finish it all up I added more stickles!!! I love these two photos. The photo on the left is my other granddaughter Paityn. She is opening her little gift on Christmas Eve which is a very cute little phone. She loves talking on the phone so this gift is perfect. The photo on the right was taken on Christmas Day which they both received these little chairs and was more than happy to seat awhile! On the left I used gold ribbon which I added a crystal buckle to it. 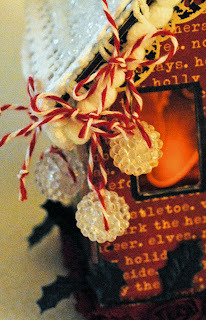 I had by Jolee an old key which I added more ribbon and a little Christmas ornament. I then added by Maya Roads the leaf stick pins. I was also given a brown snowflake from Maya Roads which I added Chestnut Roan ink and placed it behind the little photo. Then I added white and blue snowflakes and then added little pearls to the center. On the right I added little paper tags from Graphic 45 and then added a little wooden ruler. I then added blue ink to the edge and added red rick rack ribbon which I added little black pearls. I had another white cloth button which I added poinsettia and added leaves to the back of it. I did paint the button red on the edge and then added by Maya Roads leaf and pearl stick pins. I had more red rick rack at the top of the page, added black pearls, and then used Bo Bunny trinkets at the top which I added pink glass pieces around the border. I added green rose lace by Maya Roads on the left page. I used by Jolee a pocket watch and added a chipboard tag of a little child sleeping which goes perfectly with the photos. 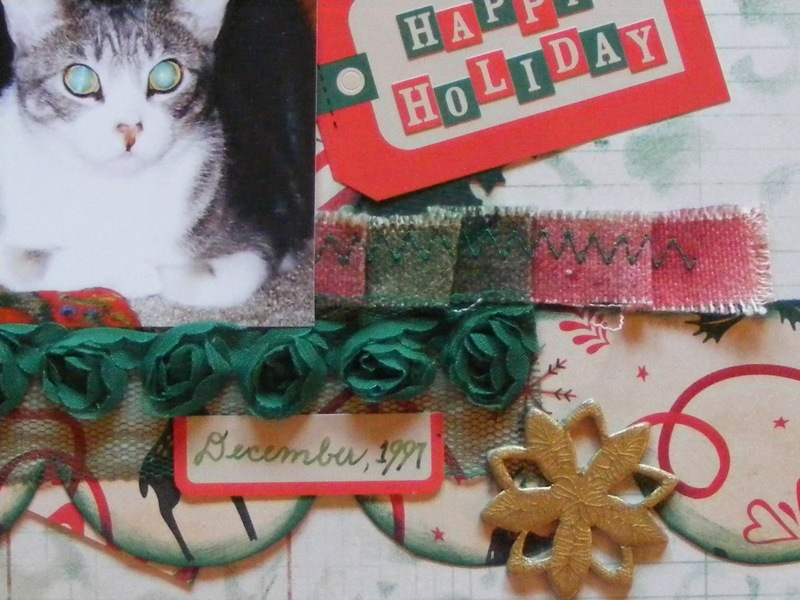 I tied both pieces together with green/gold ribbon and added a blue button. I also added a tag at the top of the page and added stickles to make it all shine. On the right I had this beautiful white flower which I added a glass button ornament and put a stick pin through it to hold it to the flower which is all by Maya Roads. I then added white and blue snowflakes with a pearl in the center to give the flower an extra dimension. In my stash I had the two little frames that I placed around their photo and then had this little tag and a little trinket to the page. I then finished it up with stickles! Thank you so much for looking at this mini album. I hope you have enjoyed viewing it as much as I did putting it all together. Hope to see you at The Crafty Scrapper soon! I love this photo and layout. This photo is me and my granddaddy, Nenny, and my younger sister Sally. It was taken at our home in Van, Texas in 1954! That was a very long time ago. I also felt that this photo really fits in well with the papers that was given to me. Hope we see you at TCS soon! I love these two little photos. The photo on the left is my youngest son Chris dressed as Tonto and the photo on the right is my oldest son Ryan dressed at the Lone Ranger. I made these two costumes which has been awhile. For Chris and Ryan are now 28 and 30!!! 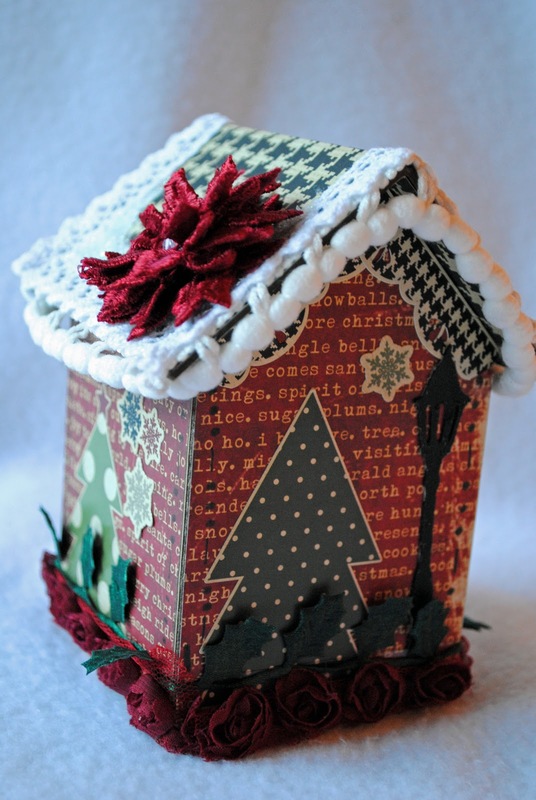 As a project for THE CRAFTY SCRAPPER design team, each designer is making a little holiday cottage by the HEART OF TEXAS STUDIO. There are five little houses in this set called, "The Village", that are each a different size and design. This one is 5" tall and 4"X 4". 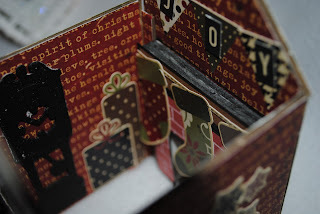 For paper, I chose the "Simple Stories 25 Days of Christmas" Collection by MEMORY WORKS, and loved the way it can be an excellent background for showing off details. The little balls decorating this cottage are "Vintage Raspberry Beads" (clear) by MAYA ROAD, and are hung with cranberry and white baker's twine by THE TWINERY. 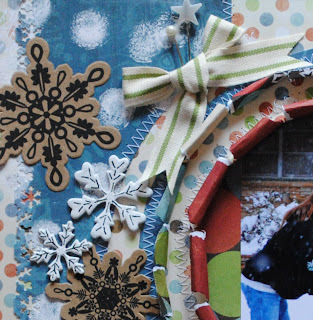 The two white trims are by WEBSTERS PAGES and were perfect for this little project! Don't they give a lovely, snowy look? For the roof I used a flat white acrylic paint by CRAFTSMART over the paper, then sprinkled "Diamond Dust" by TWINKLETS for an icy finish. 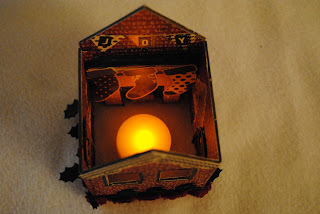 Inside the tiny house is an artificial tea light that is battery operated. These can be found in most stores that sell Christmas ornaments. Thoughts of my childhood days, playing with dolls in their doll house inspired me to decorate the inside of this little house. Not attaching the roof permanently allows the viewer to look inside the house easily. Most of the "decor" incorporates the Cardstock Stickers of the "Simple Stories 25 Days of Christmas" Collection by Memory Works. For just a little additional home-like comfort I added a chair and a grandfather clock using my Cricut by PROVO CRAFT and the "Heritage" cartridge. Both were cut from Advantus Ideology TIM HOLTZ Grungeboard (plain). They were both painted black with Ranger Ink Tim Holtz Distress Crackle Paint (Black Soot). The hearth was created by building up layers of foam from a craft store, then adhering the hand drawn brick surface. Cardstock used for this was BAZZILL BASICS PAPER (Rosey/ canvas texture). The white opaque pen is by INKSSENTIALS. The sweet holly trim is by MAY ARTS and the tiny rose trim is "Organza Roses" (red) by Maya Road. Topping off this lovely little cottage is the gorgeous "Vintage Lace Mum" (Apple), also by Maya Road. The depth of the layers is strikingly rich and draw plenty of attention to whatever this poinsettia adorns! Thanks, everyone for taking a peek at my latest creation. If you're in the area, be sure to stop by THE CRAFTY SCRAPPER in Waxahachie, Texas to see all of the little houses on display for the holiday season! 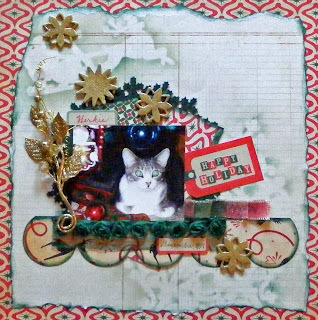 Creating this layout was a delightful experience because of the lovely BO BUNNY "Father Christmas" collection and the lovely embellishments used! 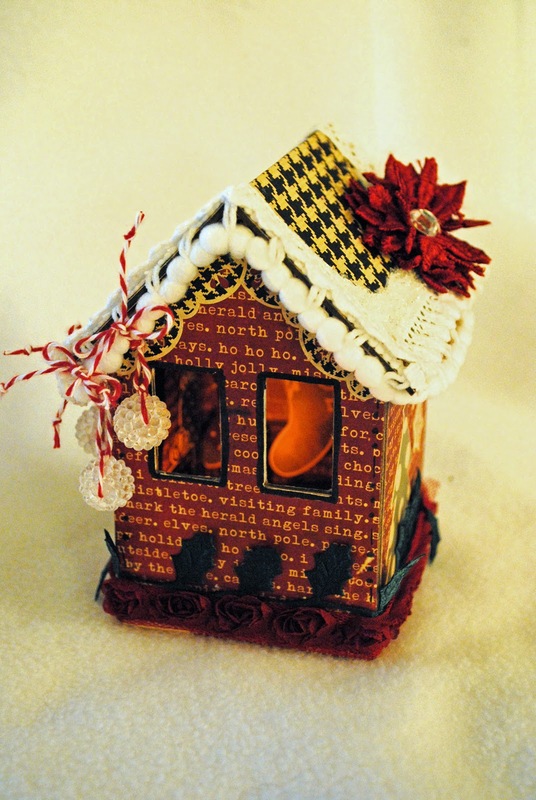 Included in the embellishments are MAYA ROAD Vintage Findings, "Grandma's Doilies" and "Paw Paw's Doilies", Let It Snow Kraft (snowflake), and Chipboard Mini Alphabet, "Audrey". Topping off the embellishment list with some lovely PRIMA flowers with holly leaves, and MAY ARTS ribbon and BoBunny pearls and buttons! Techniques used were paper distressing, inking (TIM HOLTZ) Distress Ink (Vintage Photo), machine stitching, painting (Tim Holtz Crackle Paint) layering and border punching with the MARTHA STEWART "Ribbon Loop". A new technique that I used here was paper padding, which adds depth to to the lovely oval picture of an angelic baby on the Bo Bunny paper. First, I cut out the oval shape around the child's face and then misted it with water to get it to stretch a little. Next, I stitched and inked around the edges of the oval and cut three concentric ovals of cotton batting to place under this sweet image. Last of all, I added a cardstock back to keep everything in place before adhereing it to the page. Thanks to everyone for taking a peek! Those of you who are cat lovers understand why this layout is so dear to me. This precious little kitty was just as beautiful on the inside as he was on the outside. Seven years ago we lost our precious Hercules. For a long time, I could not do any scrapbook pages about him, but I finally conquered my emotions and much to my surprise, found that doing layouts about "Herkie" actually helped me deal with our loss. The Merry Christmas Collection by BEST CREATIONS INC. was deligntful to work with. It gives a bit of a vintage look to any project using traditional Christmas colors. Other papers included are BASIC GREY'S Basic Manilla Paper Pack and BAZILL BASICS cardstock "Jade". 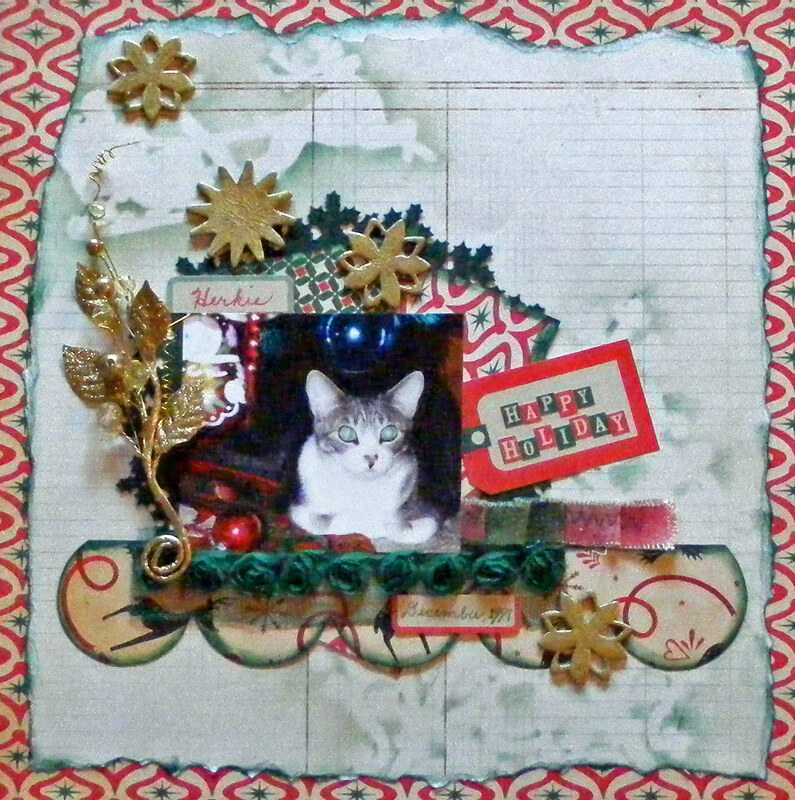 Embellishments used are PRIMA's "Medley Spray" (Midas), MAYA ROAD "Organza Roses" ribbon, COSMO CRICKET's "Dear Mr. Claus" collection's cardstock stickers, canvas fabric from my "stash" and MAYA ROAD's "Snowflake Chipboard Set". Paints, inks and stencils used here are KRYLON 18kt. Gold Leaf Pen, MAYA ROAD'S Maya Mist, RANGER INK- INKSSENTIALS Crackle Accents, TATTERED ANGELS Glimmer Mist and glimmer screen "Fanciful Stencils" and TIM HOLTZ mask "Seasonal". Other products used are MARTHA STEWART Punch Around The Page "Holly Leaves" and ZIG writer "Hunter Green". Thanks, everyone, for taking a peek at my latest creation! I love snow days! They are such rare treats here in north centeral Texas and I enjoy driving around and taking in the beauty. My wonderful husband did the driving for me this day in early 2011 and it was so very nice to get out of the house! These two young ladies were building their snowman just about a block away from were I grew up and it seemed that they were having a grand time. Rolling down the window, I asked them if I could take their picture and they were happy to pose for me. It reminded me of times gone by when my friends and I spent a chilly afternoon building our own "Frosty"! I always enjoy doing something with the paper other than cutting and pasting, and I experiment with different ways to make a layout interesting. This time, I used concentric circles and tore, rolled and stitched around them to add interest. The BO BUNNY "Blitzen" collection was perfect for the layout, as the colors bring out the colors in the picture. 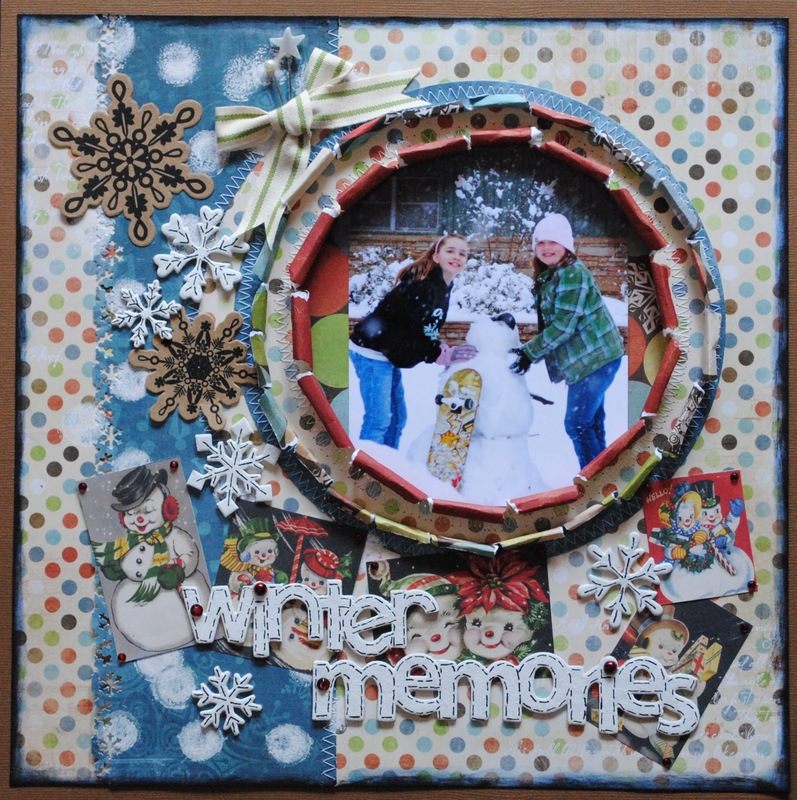 MAYA ROAD'S snowflakes (chipboard and paper) seemed a perfect way to bring out the browns in the picture, as well. Also from MAYA ROAD, I used "Snapshot Words" and "Seasons Keychain Set" and "Trinket Pins". The paper snowflakes were ready to use and I decided to paint the chipboard flakes and then doodle in black for additional detail. Other supplies used are EK SUCCESS Edger Punch "Snowflake", MAY ARTS ribbon, STAZON Ink "Jet Black", ZIG WRITER (black), ADIRONDACK Acrylic Paint Dabbler "Snow Cap" and little red pearls by BO BUNNY. 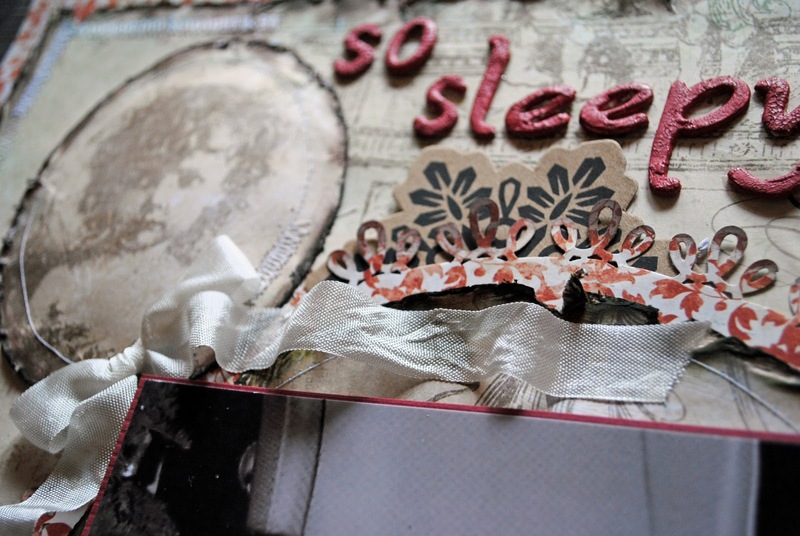 Thanks, everyone, for looking at my latest creation for THE CRAFTY SCRAPPER Design Team! You can see it displayed in the store in Waxahachie, Texas.